A’DAM Lookout is located on the north bank of the IJ river and is Amsterdam’s highest panoramic public viewpoint. 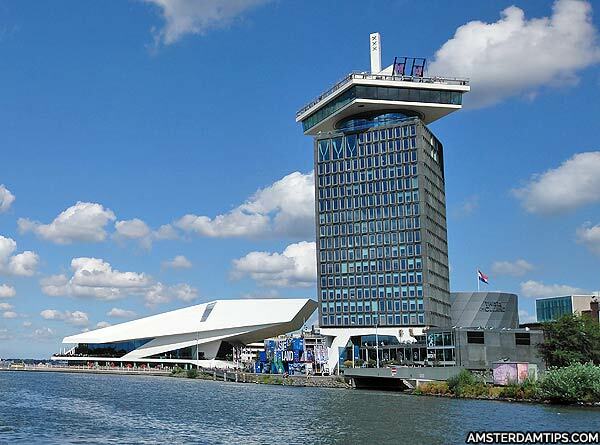 Opened in 2016, the A’DAM Lookout offers superb 360° views of central Amsterdam with indoor and outdoor observation decks, an interactive Amsterdam exhibit and a revolving restaurant. The building was renamed A’DAM Toren and opened in May 2016. At around 80 metres in height it has 22 stories topped off by a distinctive crown. Although it doesn’t quite make it into the top 10 tallest Amsterdam buildings – found mainly around the city’s periphary office suburbs. 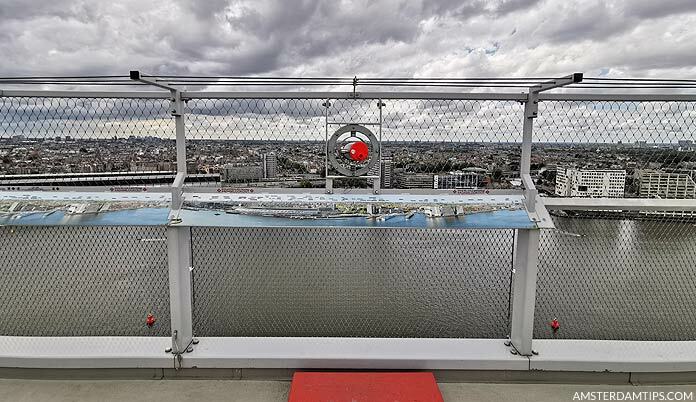 The Lookout comprises of the 20th floor indoor panorama deck – accessible by fast lift (taking just 22 seconds) with accompanying sound and lighting effects; and an outdoor skydeck on the 21st floor roof. Both decks feature handy photo illustrations that highlight points of interest around Amsterdam and beyond. The roof deck also has free-to-use telescopes. The indoor deck includes the Madam bar-restaurant-nightclub, various multimedia screens with info on the city, scale models of Amsterdam’s centre and the A’DAM Toren building – plus a vertigo-inducing floor window which lets you look all the way down to the ground. There is a digital photo memory printout included in admission – this is taken on a green screen before ascending – personally, we prefer to skip this kind of thing, but each to their own. The decks offer some great views of the IJ waterfront and Amsterdam Central station (first picture below) and an overhead perspective of the adjacent EYE Film building. You should be able to spot glimpses of Amsterdam’s main landmarks. On a clear day you can see further afield – to the Waterland fishing villages (Marken, Monnickendam, Volendam) on the north-eastern side; to Alkmaar (north-west) and even to Utrecht’s Dom tower which is some 45km south of Amsterdam. On the 19th floor there is the fine dining revolving restaurant called Moon which offers “classical dishes with a modern twist” using seasonal and local produce. It takes 1 hour to make the 360° revolution. In the rest of the building can be found various ventures: A’DAM&Co. (private members club, 18th floor), The Loft (double-level penthouse apartment space for hire, 16-17th floor), 4 Meeting Rooms (for 10-25 people, 17th floor), A’DAM WORKS (office space for creatives, 8-9th floor) and the boutique Sir Adam hotel (with 108 stylish rooms over first 8 floors). There is also a subterranean nightclub (Shelter) and the A’DAM music school, a non-profit initiative for disadvantaged young people. A high panorama point was long overdue in Amsterdam – A’DAM Lookout has brought it into line with just about every major tourist city in the world. It is a must for panorama lovers – and also those wanting to get a good bearing on the city. Opening Times 1000-2200 daily, last admission 2100. Admission Prices (2019) €13.50 for adults, €7.50 for children 4-12, students and seniors 65+. There are various family ticket combinations available that can save a few euros. An annual ticket costs €32.50 for adults, €25 for children aged 4-12. Note, the ticket desk only accepts card payments, not cash. Getting There A’DAM Toren is located on the north bank of the IJ, next to the EYE Film building and opposite Amsterdam Central station. Take the free GVB ferry from the IJ-side (IJ-Zijde) of the station to Buiksloterweg – from there it is a very short walk to the left. The lookout is at entrance A.